It must be said up front that Jessica Shattuck is a genius at character development and narrative description. 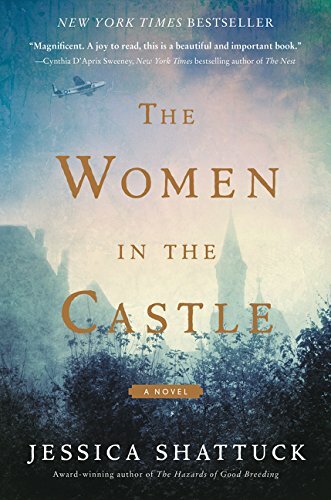 Her recent novel, The Women in the Castle tells of the relationship between three women, each of whom suffers loss and tragedy during and after World War II. It’s a story of secrets that are held in for decades—secrets that affect relationships. The story begins at the castle Burg Lingenfels, in Germany, in November 1938. Marianne von Lingenfels acts as hostess to the annual harvest party, thrown by the countess, the aunt of her husband, Albrecht. The affair opens as talk of war swirls, and a small group of resisters, led by Albrecht and Marianne’s childhood friend, Martin Constantine (Connie) Fledermann meet. The discussion unfolds around an assassination plot designed to eliminate Adolph Hitler. Both Albrecht and Connie make Marianne promise that should anything go wrong, she must take care of the wives left behind. It is at this time that Connie confides in Marianne that he is to be married to Benita, a German girl much younger than he. The story moves forward to 1945—the war has ended and the assassination attempt has failed. Albrecht and Connie are both executed for their roles in the plot, leaving Marianne to hold true to her obligation to the two important men in her life. Marianne searches and finds Connie’s son, Martin, in a youth camp. He has been taken from Benita after Connie’s execution, and it becomes Marianne’s lot to find him and his mother and reunite them. Benita is found in squalid surroundings where Russian soldiers have repeatedly raped her. Mother and son are brought together and returned to Burg Lingenfels. The third party to this reunion is Ania Grabarek, a war widow with two young sons. She brings her homemaking skills to the group, and an uneasy alliance is formed. The story continues to unfold in a sometimes awkward movement of backstory and forward story. There is no chronological movement and there are times when this takes a few moments of concentration to understand where we are in the story. And yet, this works. Most probably because of Shattuck’s strength in the areas of designing her characters through strong narrative and description that brings all five senses together to create vivid pictures of people, places, and actions. Her description of the chaos of war conveys the anxiety and turmoil just short of madness that her characters experienced. The visuals placed before the reader are at times difficult to comprehend, yet Shattuck’s command of the language makes it difficult to put the book down. There is little plot to the story—yet the character of each woman is given full attention. Her history defines her personality. Marianne is driven to meet her obligation to Albrecht and Connie, and in doing so, she is at times caring, at other times overbearing and manipulative. Benita is a dreamer—a woman who grew up in a family lacking in familial love. Her dream to escape is initially met through her marriage to Connie and her almost overbearing love for her son, Martin. That dream shatters as the war separates her from Martin, and comes to a screeching halt that finds her in a brothel, satisfying the sexual needs of Russian soldiers. That is, until Marianne finds her and reunites her with Martin. Again, through forward and backward movement, Benita’s personality is developed and through the story she becomes and remains a somewhat put-upon, pitiful character whose dreams of happiness never materialize. Ania Grabarek is a widow who joins the small group. A realist, yet not an overt one, she brings with her two sons. As life at the castle progresses, she meets and marries a local farmer, older than she. The realist in her convinces her that this alliance will ultimately benefit her sons who will inherit the farm when her husband dies. But nothing during this period is comfortable, and her life takes a turn when her first husband appears, ill and not long for the world. Ania, the realist, takes the action needed to rectify the situation. These three women, each with a story to tell, are moved by Shattuck into the late 20th century, long after the end of the war—a war that remains uncomfortably with each woman. Secrets are exposed as the story winds down, and forgiveness makes its appearance through memories and truth. Although the opening of the book proves slow to get into, Shattuck’s writing and delivery quickly bring the reader into the characters and the problems each faces as they cope with the end of the war and the direction their lives are taking. This book is a winner. Put in on your library shelf, but read it first!